Destiny 2 opens with Homecoming, a bombastic mission that sees The Tower destroyed, the Red Legion invading the Last City on Earth, and all three Commander characters from the original Destiny teaming up to mount a defence. We'll be running down a complete walkthrough of the Destiny 2 Homecoming mission in this guide, including a guide to the Homecoming boss, named Brann the Unbent Blade. If you need help with anything else featured in Destiny 2, make sure to head over to our Destiny 2 Guide hub, containing loads of useful info. Well, that escalated quickly. As soon as you gain control in the main courtyard section of what remains of The Tower, defeat the few Legionaries that spawn in front of you, and head towards the back of the courtyard, expecting more enemies to spawn after a few seconds. Group up with Commander Zavala, and you'll be tasked with repelling three groups of enemies, all of which spawn one after another. Make sure to utilise cover and your Super Abilities against the enemies here to make short work of them. Next, you'll be tasked finding the Speaker, to head down the ruined corridor to the right of the courtyard, and group up with Ikora Rey. After Rey has taken out the gunship, deal with the group of Legionaries that spawn to your left, and then take out the Incendior that opens the door at the end of the area, leading to the brand new market area. There'll be a group of Incendiors here, so make sure to shoot the tank on their backs to make them explode and deal damage to any nearby enemies. Head to the back of the market area to defeat two slightly tougher enemies, and bring a close to the Tower section of Homecoming. Once you're in the ship after being dropped off by Amanda, head up the ramp and wait for the hatch at the top to open, where you'll run into three Legionaries. After you head through the glowing barrier, turn to your left and head through the next door, where you'll encounter three Incendiors, all of which can be taken out with a quick shot to the gas tank. Head round the corner to your right, and you'll run into a sub boss called Pashk the Searing Will, who is effectively a huge Incendior that can fire rockets at you. Get up close and deal some solid damage with any Shotguns or Fusion Rifles you have to take him out, then head through the door on your right and proceed all the way up the ramp till you find yourself on the hull of the ship. Meet Brann the Unbent Blade, boss of the Homecoming mission. As soon as you're outside there'll be two Psions waiting for you, so take them out quickly and continue straight ahead, where four Legionaries will descend from a dropship in front of you. These troopers shouldn't pose much of a problem, but after you've defeated them, another sub boss named Brann the Unbent Blade will appear. This boss can prove quite tough, and is joined by a few Legionarys, but the key to beating him is be quick on your feet so as not to be caught out by his slow, but heavy weapon. Utilise cover throughout the fight, but once Brann is down to roughly half health he'll be joined by two Gladiators, armed with glowing swords and large shields. Keep moving quickly around the map, and bait the Gladiators into attacking you to leave them wide open for some hefty damage. Once you're done with Brann and the Gladiotors, head through the doorway that leads down a ramp, and continue through another door till you come to a ledge. Drop down off the ledge, turn to your left, and go through the door straight ahead of you. 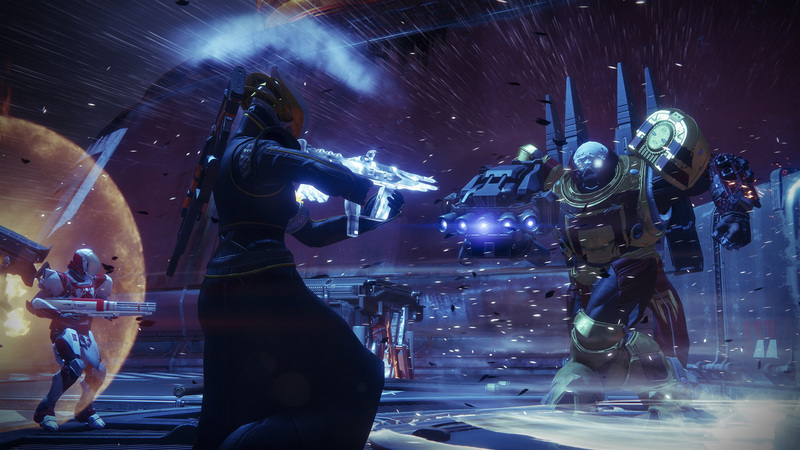 There, you'll find a few Incendiors, Legionaries, and Psions waiting for you, so make sure to utilize cover when dealing with these troops, before heading through to the final area. In the turbine room, you need to drop down into the gap immediately in front of you, avoiding the arms of the turbine, and shoot the spinning wheels till they come to a halt. Continue clockwise around the turbine to the next gap, avoiding the arms, and shoot the next group of spinning cogs. Do this once more and the turbine will stop, prompting you to continue through the large door to the next area. That's the intro Homecoming mission completed, as the player comes face to face for the first time with the intriguing antagonist of Destiny 2. If you need help covering anything else found in the Destiny 2, then head on over to any of our other guides, including our guide to the Farm Social Space, as well as our guide on every Exotic Weapon and Armor in Destiny 2. If you’re looking for a bargain this Black Friday week, we’ve got the best Black Friday Deals hub for you. It’s got the best PS4 Pro Black Friday deals, the best Xbox One Black Friday deals, the cheapest Nintendo Switch Black Friday deals, amazing prices on gaming laptops this Black Friday, smartphone deals, and the best Black Friday prices on 4K TVs.